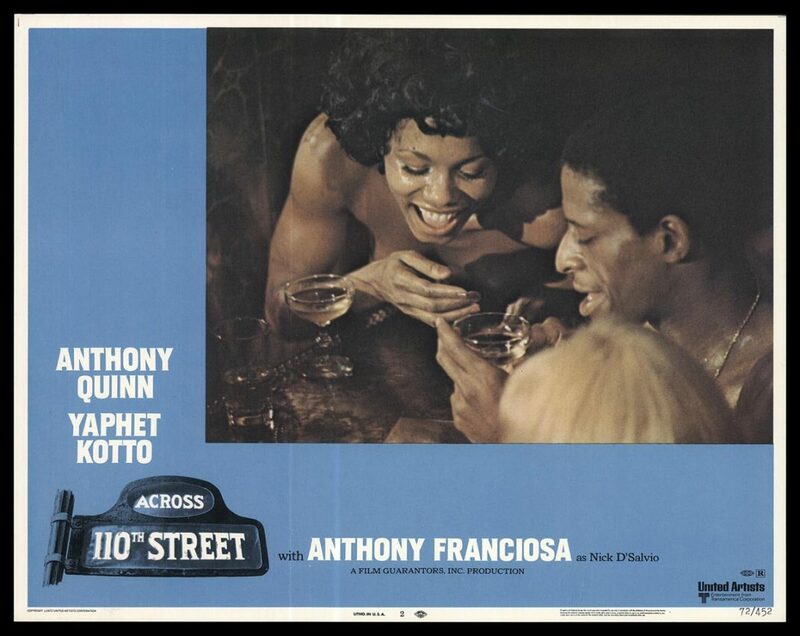 2017 may only be a few days old, but come Wednesday, January 4th & Thursday, January 5th we’re leaping right into globetrotting action with two outings from one of our favorite versatile actors, and Downtown L.A.’s veritable “Pope of Broadway,” Anthony Quinn. After showcasing him in multiple collaborations with director J. Lee Thompson this past September, we’re presenting two ‘70s-era films he made for two other dependable, if lesser-heralded genre directors, both based on books by very location-specific authors, and presenting the magnetic Quinn in complex, somewhat anti-heroic circumstances. 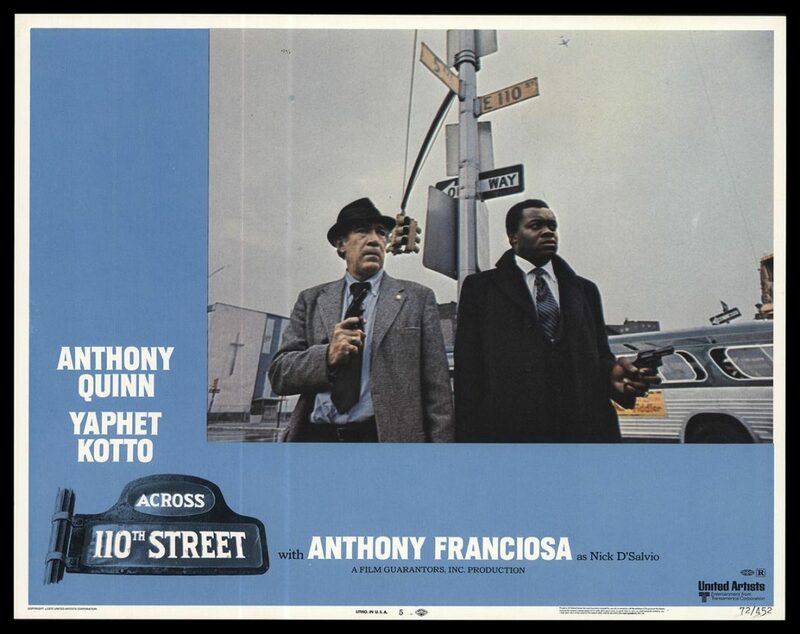 Start by taking a dangerous 1972 trip Across 110th Street, where Quinn plays racially callous and morally compromised Harlem police Captain Frank Mattelli, paired with young, straight-arrow Lieutenant William Pope (Yaphet Kotto). They’re both searching for the reckless thieves/killers that knocked over a Mafia-owned bank. When the trail reveals that this incident has ignited a race war between Italian mobsters and Harlem crime bosses, the chances of bringing the criminals in alive grow dim, and Mattelli recognizes that his career is likely going to be a casualty in this battle as well. 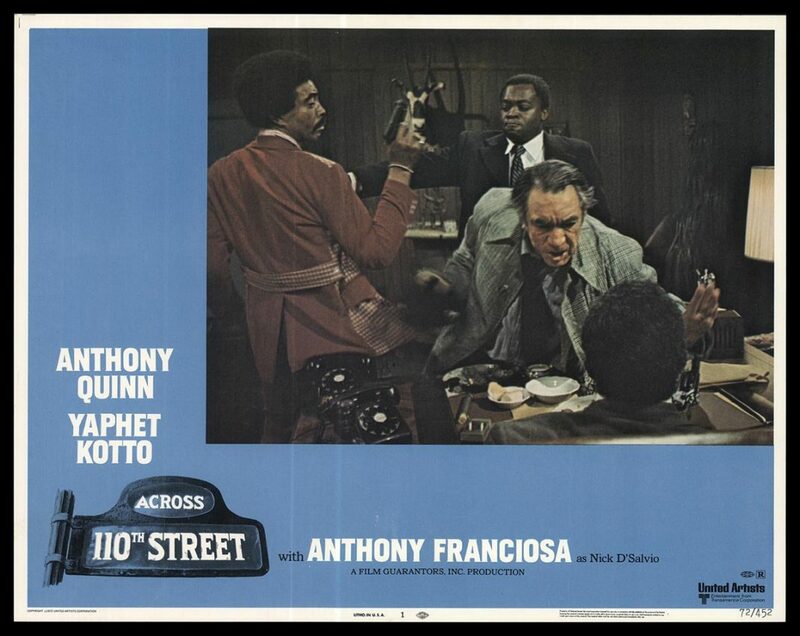 Across 110th Street began as the sole published novel by Wally Ferris, a NY-based TV cameraman; it was adapted into a screenplay by playwright/screenwriter Luther Davis, whose diverse credits included The Hucksters with Clark Gable, the stage and screen incarnations of the musical Kismet and the Olivia de Havilland thriller Lady in a Cage. Directing the action is Barry Shear, who previously made Wild in the Streets and proto-River’s Edge teen murder drama The Todd Killings, as well as hundreds of hours of TV. Quinn doubled as producer on the film, and previously attempted to lure John Wayne and Kirk Douglas to star as Mattelli before taking the role himself. 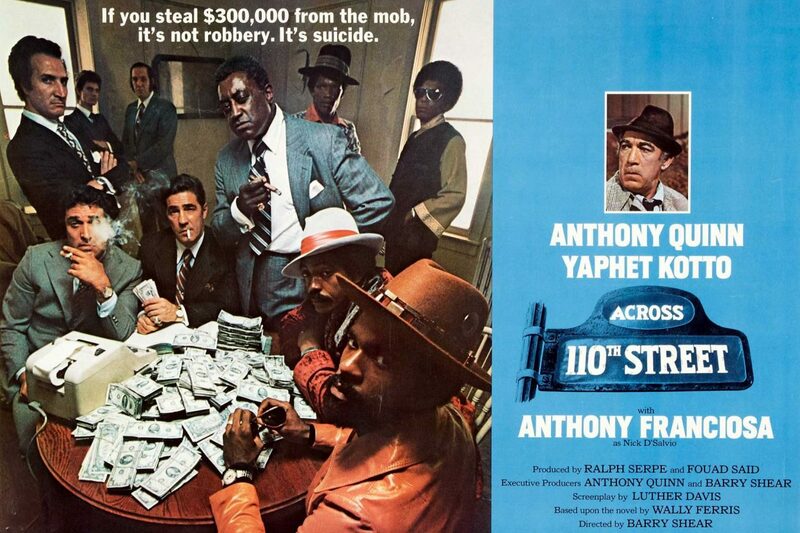 The supporting cast includes some of the best black character actors of the era, including “Huggy Bear” Antonio Fargas as the first fingered thief, Richard Ward, seen in Mandingo and The Jerk as boss Doc Johnson, and Bond girl Gloria Hendry as an unsuspecting girlfriend of one of the crooks. The title theme by Bobby Womack received a large second life as the opening credits music for Jackie Brown with Pam Grier; Womack performs four other songs in the movie with composer J.J. Johnson. The production was also notable for being the first shot with the Arriflex 35BL, a blimped camera both compact to shoot quick setups and handheld shots, and quiet enough to allow for clean direct sound recording on location. The intrigue crosses the hemisphere to Africa for Target of an Assassin from 1977. President Lunda (Simon Sabela), embattled leader of emerging nation Gamba, is taken to a hospital after an assassination attempt. His assigned orderly, Sailor Slade (Quinn), takes advantage of the infirm head of state and abducts him, hiding him in a remote location and ransoming him for $100,000. Revelations about the desperate motivation behind this bold gesture will create an unlikely bond between captor and hostage, especially when the foiled assassin (John Phillip Law) is determined to find and finish his hit against the President. 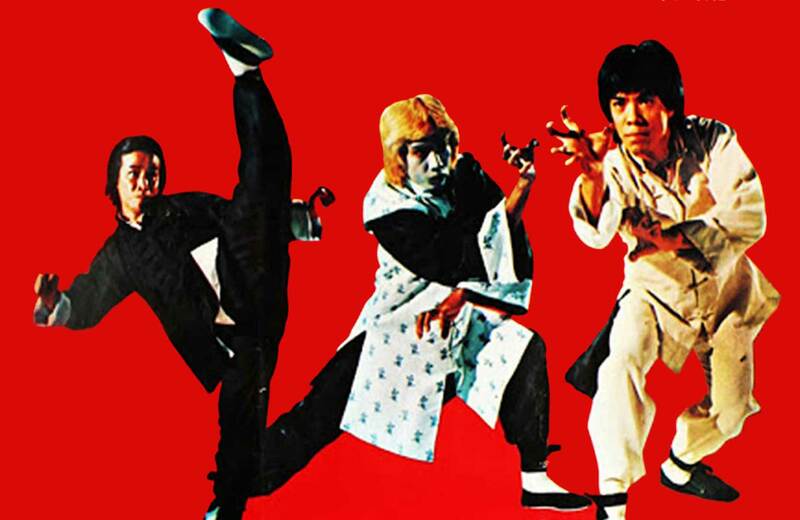 Though Quinn and Law are the only immediately recognizable faces in the film, the South African supporting cast have plenty of interesting achievements as well. 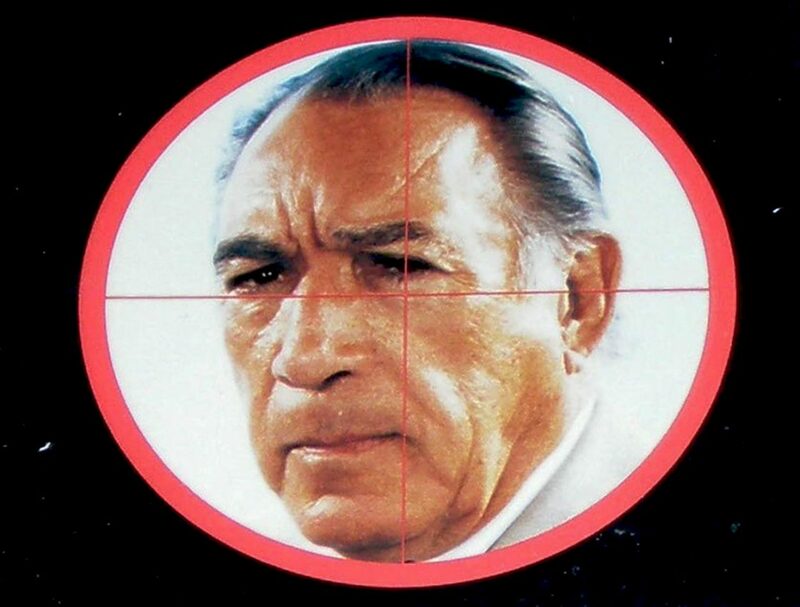 Simon Sabela, playing the vulnerable President, appeared in many action films shot in the region, including New Beverly favorite Zulu Dawn, and two Roger Moore vehicles, Gold and Shout at the Devil; he was also the first black director to emerge from South Africa. Co-stars Marius Weyers and Sandra Prinsloo would appear years later in Jamie Uys’ 1980 surprise worldwide smash The Gods Must Be Crazy. Weyers has also appeared in episodes of “The Golden Girls” and “Designing Women”, and in Blood Diamond with Leonardo DiCaprio. Peter Collinson, best known for making the original The Italian Job in 1968, directs from a script written by British character actor Scot Finch, who picked up a second career as a screenwriter with credits like Catlow (from the Louis L’Amour novel) and The Beast Must Die; he previously helped adapt another L’Amour book, The Man Called Noon, for Collinson. The story was adapted from the book Running Scared by the late South African author Jon Burmeister, who left a successful career as an attorney to become a crime fiction writer; it is the only one of his books that has been made into a film. Note that while this movie has frequently popped up on those ubiquitous DVD multi-packs, it is currently not available on any of those sets in its original 1.85 ratio, making this a rare chance to see it in its intended theatrical composition. Come begin the new year with the charismatic Anthony Quinn in two unique dramas marked by their regional intrigue and fraught history. You’ll agree that even as a questionable protagonist, he’s an excellent guide to cinematic adventure!